The beauty of the internet is the opportunity to read reviews, check ratings, and find out the good and bad experiences others have had with vendors. An easy way to learn more about the legitimacy of a company is to run their name through a quick online search. If the company is in the business of scamming people out of tickets, there’s a good chance others who have been affected have posted about their experience. There are a plethora of opportunities to buy tickets directly from other individuals through social media platforms. Though great deals often appear, purchasing tickets from other consumers is risky as it may result in ticket scams and the misuse of your personal information. It’s also important to be wary of electronic tickets. E-tickets can be easily reproduced and scammers will print off as many copies of a certain ticket as possible. All of these tickets will work perfectly when entering the event, but only the first one scanned will be valid - while the rest will be denied entry. After your purchase has been made and your ticket arrives, always take a closer look. Does the ticket include the block, row and seat details? Other easy-to-spot signs of a fake ticket include: incorrect event information, low quality paper, blurry text, uneven margins and jagged paper edges. 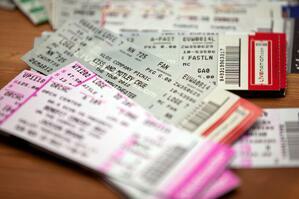 Don’t let ticket scams take the fun out of your upcoming summer events. Take the extra time to make a conscious ticket buying decision – and enjoy!